It is getting close to one of my favorite Holidays of the year and I though I would post a receipe for everyone to try if you are interested. 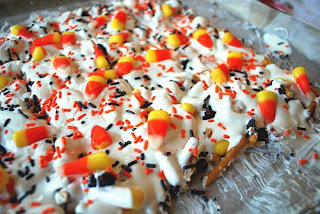 This is perfect for those that have a sweet tooth and love candy corn! 1 1/2 C pretzels, broken into pieces. Cover a large cookie sheet with wax paper. Spread broken cookes, pretzels and about 3/4 C of the candy corn onto the waxed paper. Place white chocolate in a container and microwave for 1 1/2 minutes. Stir and then microwave for another 30 seconds until melted and smooth. White chocolate melts faster and burns easier than chocolate. Wow! That has to be so yummy, especially since it also has the salty pretzels in there. I think I'd better pass on making it though. I'd probably make myself sick eating half of it! Thanks for sharing the recipe! It's so pretty too! Oh Marla, this sounds wonderful, but if I make this I will have to take it into work so I won't sit and eat it all by myself. Thanks for sharing. I love candy corn!!! One of my favorite things about autumn! I think I'll try this but I'm afraid I will eat the whole thing! I wonder if it will freeze well?